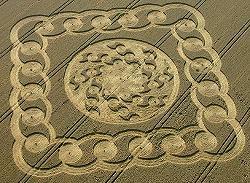 Would the Zetas care to comment on the new Crop Circle in Beckhampton that was updated yesterday to show the aerial view? Looks more complicated than some recently, and is definitely the most well defined of the year thus far. We stated early in the 2005 season that Circle Simplicity was to be the rule, and this has held through June. The lack of real competition in large and elaborate designs encouraged frauds to proliferate, half the designs laid down in Britain clearly frauds during this 2005 season, an increase over the number of Hoaxes of the 2004 season. Seeing this trend, Beckhampton was made large and elaborate, to stand in contrast to the plethora of frauds. The themes we explained during the 2004 season are repeated, for emphasis. The Magnetic Trimesters of the Sun, with the outburst from May-Aug being the strongest, is the message from Clatford Bottom, Bluebell Hill, and Rockley in the designs laid down in Britain. 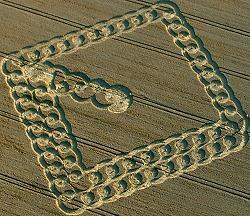 The Serpentine Dance is shown again in Beckhampton, this time placing the retrograde orbit and rotation of Planet X closer to the Sun. The Slow 270° Roll that Planet X is in the process of making is repeated again in Toot Baldon, with the first of the dual 270° rolls emphasized. Most reminiscent of Eastfield during the 2004 season, the Contorted Path of these rolls mirroring one another. Magnetic flow lines are emphasized in Silbury Hill, where the closeness of Planet X to the Sun at this time is shown to be distorting both their magnetic fields. The hapless Earth is caught beyond Planet X in the eddy flow of particles, and the position where Earth is not, her normal June 21 location, is shown on the opposite side of the Sun. Heavily emphasized during the 2005 season are the four seasons humans use to measure their year. Seasons are being arranged for mankind during the slow 270° roll, as they have been during past pole shifts, in order to ensure life continues on planet Earth. But nevertheless, the four seasons are what mankind recognizes, 12 months, so the symbolism hard to miss. Burwell and Lurkley Hill mirror each other in their pattern, Lurkley showing the normal balance, with Burwell relaying that the stress on the Earth will be most heavily felt twice a year, as the Dec 26 tsunami quake has already shown, during December and June of the calendar year. 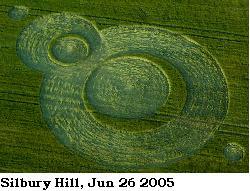 Monkton Down echos the 2003 Southfield and Eastfield circles and the ancient Nebra Disc in the months of the years shown as 20 or multiples thereof, a different calendar than used today. 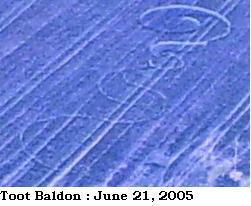 The 2005 season has much to relay, with Monkton Down and Burwell relaying the grim message the Earth will have participated with the 270° roll for a year, tilting and wobbling, a time of extreme stress for the Earth's crust and confusion for its populace.